STEP ONE Lower spare tire for access to the winch mechanism mounted above the frame cross-member. 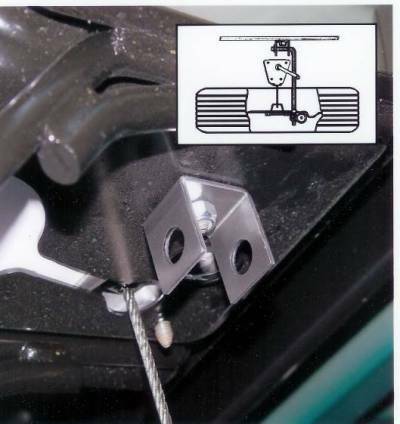 Locate the threaded ends of the two winch mechanism mounting bolts which extend down through the frame cross-member. Install U-bracket over the threaded end of mounting bolt to the right side of the winch cable. Position the U-bracket with the open side parallel to the side of frame cross-member, as shown. Install the U-bracket with the provided locknut. STEP TWO Install the lock bar through the holes in both legs of the U-bracket, with the grooved end facing toward the front of the truck. Place the crimp-ring retainer in the groove and crimp closed with pliers.